John Berggruen Gallery is pleased to present A View From Above, a survey of works by American and International artists whose aesthetic styles and prolific works ask the viewer to slow down and consider their every detail as physical fact, artistic choice and purveyor of meaning. A View From Above will occupy the second floor of gallery space and will include work by artists Vija Celmins, Chuck Close, Mark di Suvero, Olafur Eliasson, Helen Frankenthaler, Tom Friedman, Anish Kapoor, Julian Lethbridge, Julie Mehretu, Martin Puryear, Iran Do Espirito Santo, and Joel Shapiro. The exhibition opens Tuesday, May 17th and continues through Saturday, July 30th. Vija Celmins received international attention early in her career for her renditions of natural scenes, which often dispel romantic notions of the sublime in nature. Celmins deliberately chooses as her subject a kind of pictorial information that looks familiar but tells us almost nothing about the realities to which it refers. 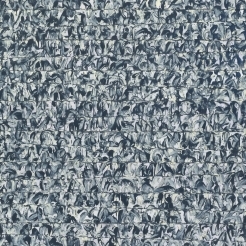 On display, Starfield’s (2010) mere pattern of white dots separated by areas of densely worked graphite fittingly presents the viewer a myriad of options: is it an image the artist invented, was it viewed from a telescope by an astronomer who then photographed it, or was it a record made automatically by the instruments themselves: no one's view. In similar fashion, questions cannot be detached from one’s experience of Mark di Suvero’s sculptures, which is hardly passive. Di Suvero’s interactive sculptures like Evrard's Marc (2010) which is on display ask you to move different parts, to walk around, and to watch elements turn and tilt. 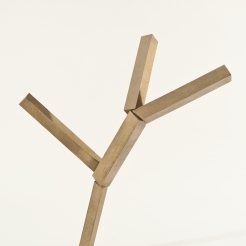 In relationship to the viewer’s movement, the angles constantly change. These mysterious instruments are at once aerodynamic and clunky; whose purpose one can never quite deduce. Another highlight includes the Danish-Icelandic artist Olafur Ellison’s Super Star (2008). A rainbow star wrapped in brass bands suggests elliptical orbits, recalls holiday decorations, religious symbols, and children's toys. It also resembles a giant jewel, with gorgeously cut facets reflecting every color of the spectrum. 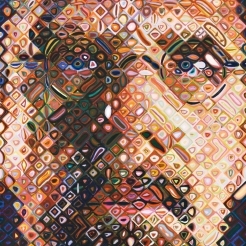 But rather than settling on any one of these interpretations, it evokes a more expansive experience. Ingeniously crafted from tinted glass, mirrors, brass, and halogen light fixtures, it casts kaleidoscopic patterns on the domed ceiling and shines soft beams of light on visitors, who then become part of the art. 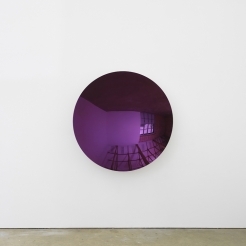 Two works by the London-based Indian artist Anish Kapoor will also be on display. Double (2004) and Untitled (2007) with blazingly reflective metal surfaces dispense multiple visual thrills and mysteries. They carve, color and complicate space in different ways, creating an interactive experience. 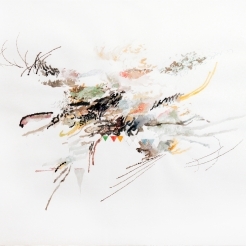 Other highlights include Julie Mehretu’s 15-foot-long abstract etching Auguries (2010), a combination of delicate markings reminiscent of Chinese calligraphy and bolder architectural shapes. The work was also the centerpiece of Notations After the Ring (2010), an exhibition at the Metropolitan Opera’s Gallery Met, which grew out of the visual language she explored in a suite of six paintings that made up the Grey Area (2010) show at the Guggenheim Museum. 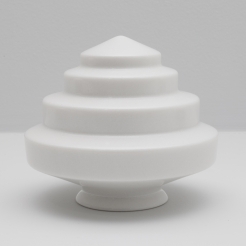 Works by Iran Do Espírito Santo, one of Brazil’s key contemporary artists, reveal his interest in industrial and everyday sculptural forms distilled down to their very essence. These sculptures, realized in deceptive “incongruous” materials belying the heavy mediums used to create his “cans” and “ice cream pots” - all strangely crafted in stainless steel and marble. The effect created is one of confronting a form’s pure essence. 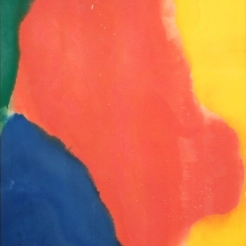 Individual “views” of the world are expressed in this show in Helen Frankenthaler’s 1963 saturated painting September Image, Martin Puryear’s sculpture Face Down (2008), and Joel Shapiro’s Untitled (1986) falling figure. 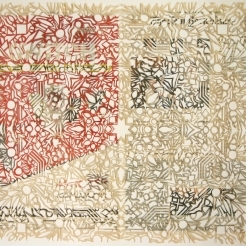 In all cases, these works provoke viewer participation, contemplation and individual responses.